Bedrooms in the Main Building above the Dining Hall and Dole Wing are on the second floor, some with mountain views! There are two accessible first floor rooms with private 1/2 baths located in the Perry Wing adjacent to the Dining Hall. Public bathrooms with showers are located on both floors. The floor plan is here. 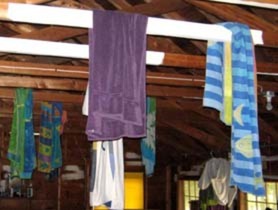 Over a dozen family cabins range along the top of the riverbank overlooking the Saco River. (See the Interactive Map.) Families have first priority for cabins, then couples, then those staying a week or more. Lodging assignments are at the discretion of the Camp Registrar. © Anna Rich 2009 All cabins have a 3/4 bath (toilet, sink, shower). Nearly all have screened-in porches facing the river. Some have a small fridge. Bray, Twitchell, and Lawrence each have two separate units. Twitchell South is wheelchair accessible. 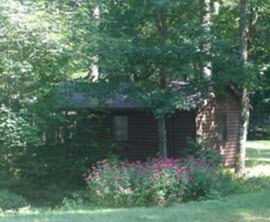 Woofenden, Perry, and the Boston Cabin each have two bedrooms. 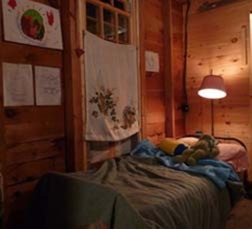 The Boston Cabin also has a sleeping loft and two baths, one off the master bedroom. Woofenden, Perry, Laird, and the Boston Cabin have kitchenettes. Cut into the woods near the state line are six camp sites (3 with electric and water hookups) for those who wish to pitch a tent or park their camper. There is a nearby 2-unit bath house including a shower, for their use. 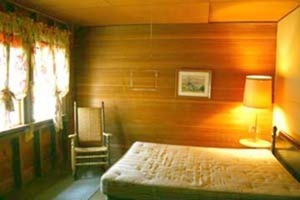 The Boys Bunkhouse is located in the northeast corner of the grounds, with a bathroom and shower in the Mack Cabin next door. The Girls Dorm is on the second floor of the Goddard Annex in the Main Building, and has a full bath with several sinks and toilet stalls, a bathtub, and a separate shower. Each teen dorm has a resident adult Dorm Parent. Senior Flame boys are housed in the Mack Cabin. Senior Flame girls are housed in the Single Women's Quarters (SWaQ!) in the Main Building above the Dining Hall. 1. To learn how housing is assigned during camp, please see the Housing section on the Registration page. 2. To learn where specific rooms and cabins are, please see the FNCA Map.